The Building People is pleased to welcome Tara Rivers as the news member of our corporate leadership team. 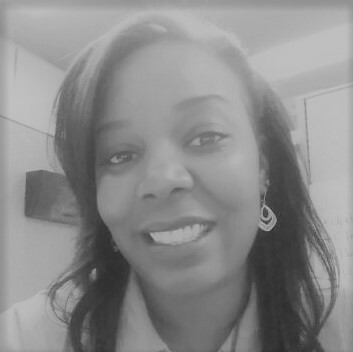 Ms. Rivers brings 12 years of expertise providing Contracts and Procurement Management in Federal contracting for both large and small businesses. Prior to The Building People, Ms. Rivers worked at Verizon Business as a contributing partner and also developed Hitachi Data Systems Federal, a subsidiary of Hitachi Data Systems. Ms. Rivers has supported the Federal practices at Intel has also provided professional consulting services to small businesses as they graduate from SBA programs. She is also a chapter member with the National Contract Management Association (NCMA) where she speaks publicly on best practice in contract management and administration. Ms. Rivers has completed her FedPub Seminars’ Master’s Institute in Government Contracting and holds a Bachelor’s of Science from Old Dominion University and is currently completing her Masters in Public Policy. Please join us in welcoming Ms. Rivers to the team! 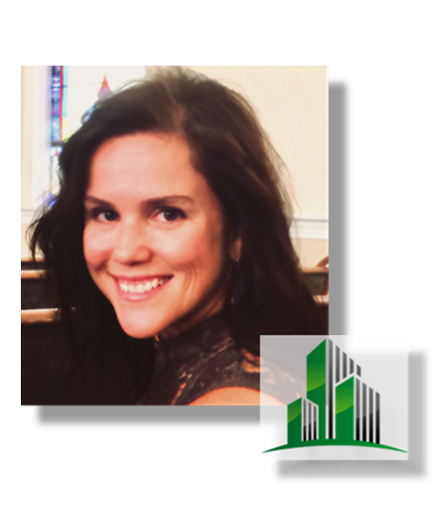 She can be reached at tara.rivers@thebuildingpeople.com or by phone at (703) 669-2222. The Building People is please announce the arrival of Laura Fabeny as the new Senior Program Manager for our Department of Energy Energy Efficiency and Renewable Energy Office (EERE) Business Administration Support Services (BASS) contract. Ms. Fabeny is an industry professional with an impressive background supporting innovative energy and sustainability programs across the country. For the past several years, she has managed the Mission Oriented Technical Support (MOTS) contract with the Department of Energy’s Energy Efficiency and Renewable Energy Office, where she was responsible for the technical and contractual oversight of all DOE HQ staff supporting the MOTS contract. In this role Ms. Fabeny managed more than 60 staff across multiple technical programs including the Building Technologies Office, the Advanced Manufacturing Office, Solar Energy Technologies Office, and the Federal Energy Management Program. As Contract Manager at The Building People, Ms. Fabeny is responsible for the allocation and tracking of a millions in annual budgets for multiple tasks within each program, including subcontractor allocations, fiscal year funding tracking, tracking costs against deliverables, and obligated/costed/uncosted notifications. She will work directly with EERE program leadership as The Building People’s client representative to help ensure they achieve their programmatic goals. Additionally, she will work with teams to develop task order scopes, budgets, performance metrics, and staffing requirements for new initiatives. 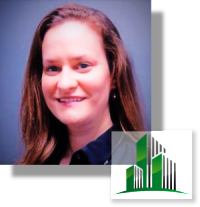 Ms. Fabeny is a James Madison University Graduate, holds an MBA from George Mason University, and is a PMP certified project manager. Please join us in welcoming Ms. Fabeny to The Building People team. Ms. Fabeny can be reached by email at laura.faeny@thebuildingpeople.com. Please join us in welcoming Amy Boyce to The Building People as the new Director of Engineering Services. 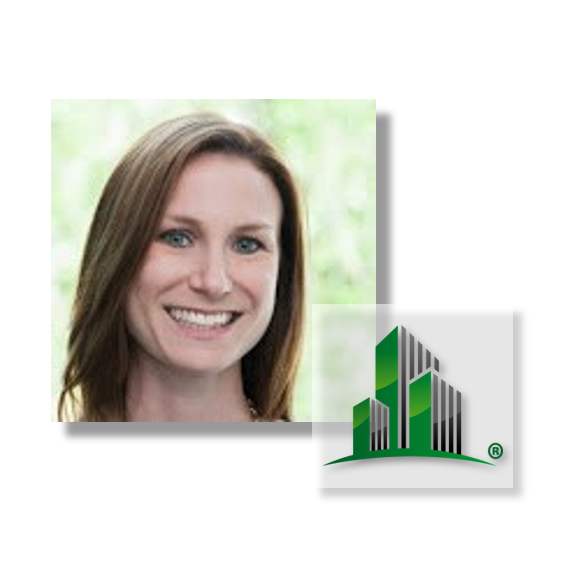 Ms. Boyce brings over 16 years of experience to the company, focusing on the areas of engineering and energy management best practices. She is a licensed mechanical engineer, previously practicing in the areas of building design and construction, sustainability, and energy efficiency. Her work has spanned a variety of building types, including commercial and government properties, in locations throughout the United States as well as overseas. Ms. Boyce earned her MBA from Georgetown University and holds a Bachelors of Science in Mechanical Engineering from Pennsylvania State University. She is located at The Building People headquarters office at 113 East Market Street, Suite 210, Leesburg, VA 20176 and can be reached by email at amy.boyce@thebuildingpeople.com or by phone at 703.669.2222. Mike Atsbaha is a Senior Financial Analyst with The Building People where he brings more than 13 years of experience in budget formulation, renewable energy analysis, and financial modeling. Mike currently supports the U.S. Department of Energy’s Building Technology Office (BTO), to coordinate spending plans, budget formulation, and execution duties for $200 Million in projects. This has allowed Mike the opportunity to work with national laboratories to meet their financial needs, as well as providing analysis in response to both DOE front office and congressional budget requests. Prior to that, Mike was responsible for all project tracking and financial analysis for the $4 Billion Presidential Performance Contracting Challenge in addition to preparing the management and budgetary reports for the EPA’s Energy Star program. Amanda Chiu is a Senior Project Management Analyst at The Building People with over 10 years of experience working in clean energy and climate change. Amanda supports the U.S. Department of Energy’s Building Technologies Office where she focuses on capturing and sharing lessons learned related to the adoption of energy efficient technologies through residential energy efficiency programs. Her research areas included renewable energy technologies and climate policies at the state, national, and international levels. Ben Murray is a Senior Financial/Budget Analyst and Project Manager at The Building People, with more than 14 years of experience providing financial and managerial oversight in a technical environment. Ben has provided service at the Department of Defense and the Department of State. For the past 3 years, Ben has served at the Department of Energy/Energy Efficiency and Renewable Energy supporting the Wind Energy Technology Office. In his position as a Senior Budget Analyst, his responsibilities included managing daily budget operations, formulations, execution, and funds control. Recently, Ben has advanced into an additional role as a Project Manager supporting the Technological Development team– leveraging his experience working in the tech environment to further push The Building People along our road of success. Stacey Young is a Senior Conference Manager at The Building People where she brings 21 years of experience as a meeting planner, communications expert, and outreach coordinator. Her experience includes 19 years as a Senior Meeting Planner/Manager for government contractors and 2 years working in Conference Services for clients in high-end hospitality services. Stacy helps clients plan, develop, and implement meetings, conferences, workshops, and expos that range in size from 10 attendees to 3,000 attendees. She works primarily with the U.S. Department of Energy’s Office of Energy Efficiency and Renewable Energy on all of the organization’s logistic needs, such as creating and monitoring budgets; conducting site selections; negotiating contracts with hotels and other vendors; creating, operating, and maintaining invitational and registration databases and websites; designing, preparing, planning, and man powering exhibit halls and poster sessions; planning receptions and tours outside of the meetings; and handling travel for attendees. Ken Slattery is a Senior Project Management Analyst at The Building People, has extensive experience in administering home energy efficiency initiatives across several sectors and in a range of capacities. In addition to his work for the U.S. Department of Energy’s Home Energy Score Program, he has managed residential energy efficiency programs for utilities, for both private contractors and state governments. He has assisted in the development of energy audit software programs for industry-leading suppliers, and has logged several hundred home energy audits in the national HERS structure. He was a key team member in the design of home performance programs at the utility and state government level, and has implemented pioneering low-income weatherization programs. Ken developed a home performance business approach for a large HVAC firm in Kentucky, and has worked in the commercial application of LED lighting and solar PV. His experience encompasses the entire spectrum of energy efficiency improvements for the built environment, in crafting policy for the adoption of energy efficiency in the private sector, in technical training for contractors, and in project management. Please join us in welcoming Betreace Everhart, The Building People’s new corporate office Administrative Assistant. Betreace brings 17 years of experience in small to large-size organizations with a background as a coordinator for executive meetings, travel arrangements, calendar management, financial reports and other corporate administrative tasks. Prior to joining The Building People, Betreace provided her services for commercial retail organizations in various roles and programs to support their missions. Betreace has supported commercial retail organizations in customer service, business administration, and team management for top executives to ensure smooth operations across their organizations. Betreace holds an Associate of Science degree from Kaplan University. While attending Kaplan University, her area of studies centered in accounting. She will attend an online university in the fall to obtain and complete her Bachelors of Science degree in Accounting. Betreace Everhart is located at The Building People headquarters office at 113 East Market Street, Suite 210, Leesburg, VA 20176 and can be reached by email at betreace.everhart@thebuildingpeople.com or by phone at 703.669.2222 x100. 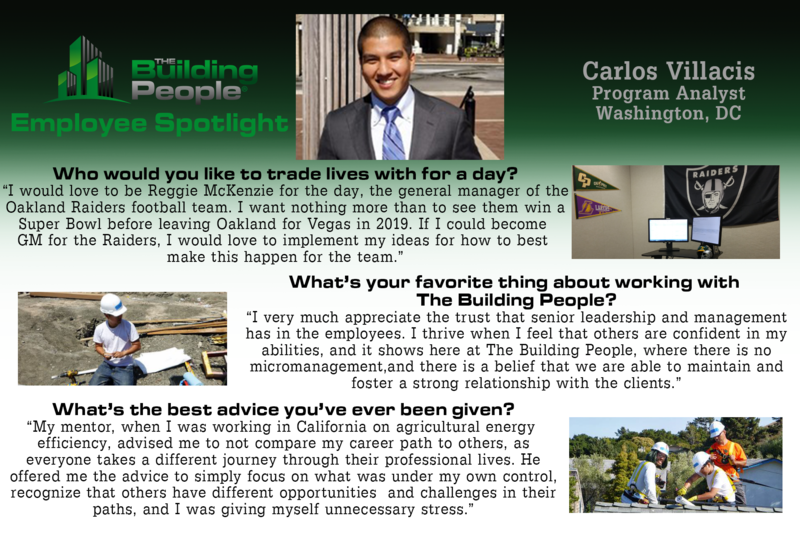 This Employee Spotlight features Carlos Villacis! Carlos works for The Building People as a Program Analyst based in Washington D.C. serving our clients at Department of Energy, Office of Energy Efficiency and Renewable Energy. Although he has only been with us for a couple months, Carlos’ enthusiasm and energy has been recognized by many, and we are so excited to have him on board! Congrats Carlos! Learn more about him by reading below.